This is a method I was exposed to when I shadowed the England National Team. I think that the idea of keeping ’12 yards’ between Defenders is effective. However, maybe it is not supposed to be taken literally, but more as a guide for the players to be aware of their distances from each other. 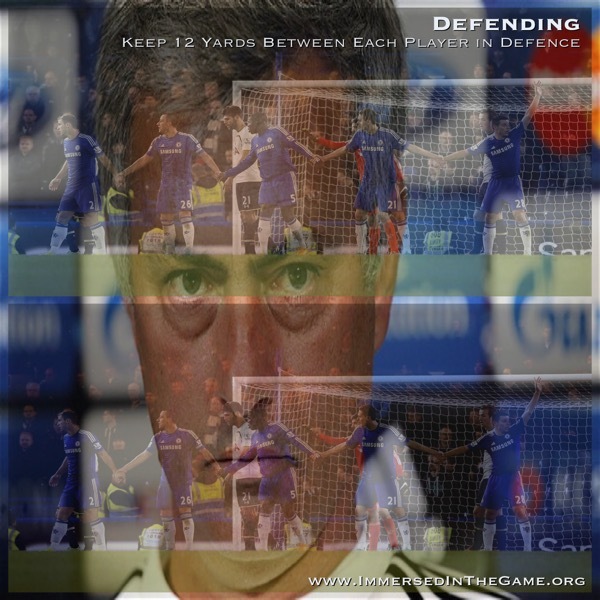 In the above image, the Chelsea FC defence are holding hands. This echoes the well-known method used by George Graham as Arsenal Manager, he regularly worked with his defence having them hold training bibs between them, keeping the space pretty much the same as is depicted by the modern-day Chelsea FC players.